HUBER+SUHNER, will showcase their innovative solutions for military applications at DSEI 2017, the world leading Defence and Security Event. Among the technologies on display will be HUBER+SUHNER’s Direct GPS-over-Fiber solution, which perfectly addresses the power supply challenges within a GPS system by making use of newly developed Power-over-Fiber technology. This new technology enables system improvements by eliminating all copper within the link and also reduces the amount of hardware within the system by integrating the transmission functionality into the antenna. Also on display is HUBER+SUHNER’s latest development in its SENCITY Shield range of broadband jamming antennas. SENCITY Shield was specifically developed to meet today’s challenging requirements for ECM missions in military and security applications. The low profile, shark fin design ensures low visibility while still providing exceptional electrical performance in terms of horizontal gain and high-power capabilities. The latest incarnation — SENCITY Shield 10 — supports an ultra-broad frequency range of 600 MHz to 10 GHz. 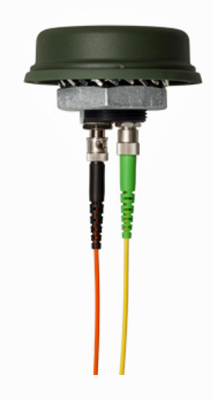 According to BJ Lyman of HUBER+SUHNER, the company's GPS-over-Fiber products are well suited to a number of antenna remoting, signal distribution and other high-tech applications in challenging environments. They perfectly suit the military, but can also be used in scenarios as diverse as mines, subways, special-purpose vehicles and off-shoring infrastructures. Exhibition visitors can see these solutions for military applications at HUBER+SUHNER’s stand, which will be part of the Swiss pavilion at Stand S8-151, ExCeL, London, September 12 to 15, 2017.